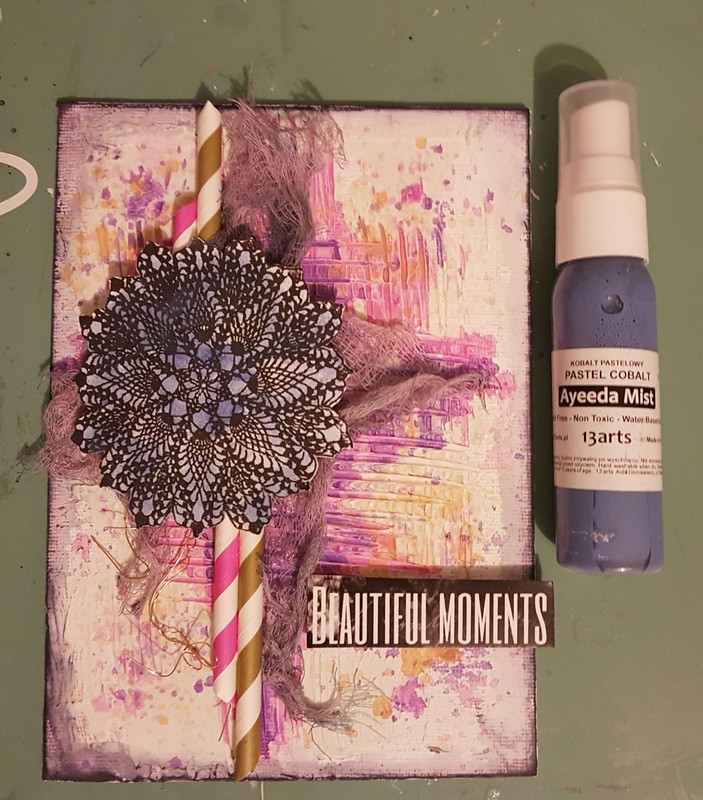 Today is my turn over on the Sassy Scrappers Blog and I am sharing with you a mixed media canvas I created using 13arts papers and sprays along with Prima’s Color Philosophy Dye Inks. So let give you a quick tutorial in how I created this. I have to apologise for the process photos…. we have just moved into our new house and the lighting isn’t the best. I started off by applying modeling paste to my 5×7 inch canvas board and used a comb like tool to create the lined texture. I then applied 13arts Ayeeda Mists Pastel Pink, Lavender and caramel using a wet paint brush. I also used those sprays to splatter around the edges. 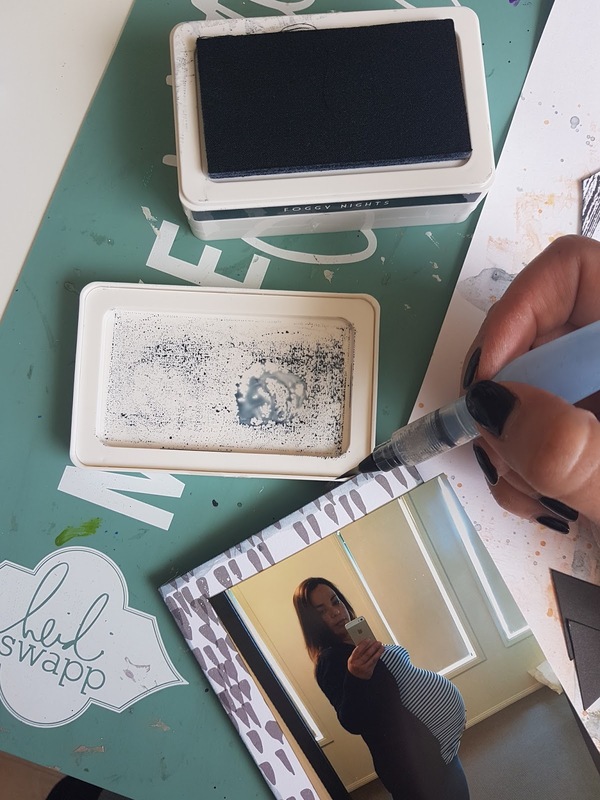 Once dry, I then inked around the edges using Prima Color Philosophy Ink – Foggy Nights and with a wet paint brush just lightly went over the edges to create a shadow like effect. 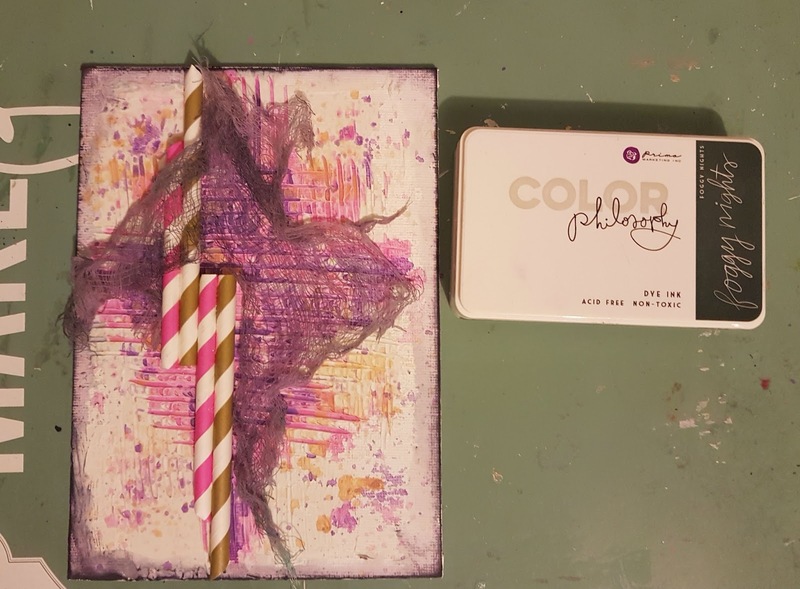 I then cut 2 straws in half and adhered them to the canvas. 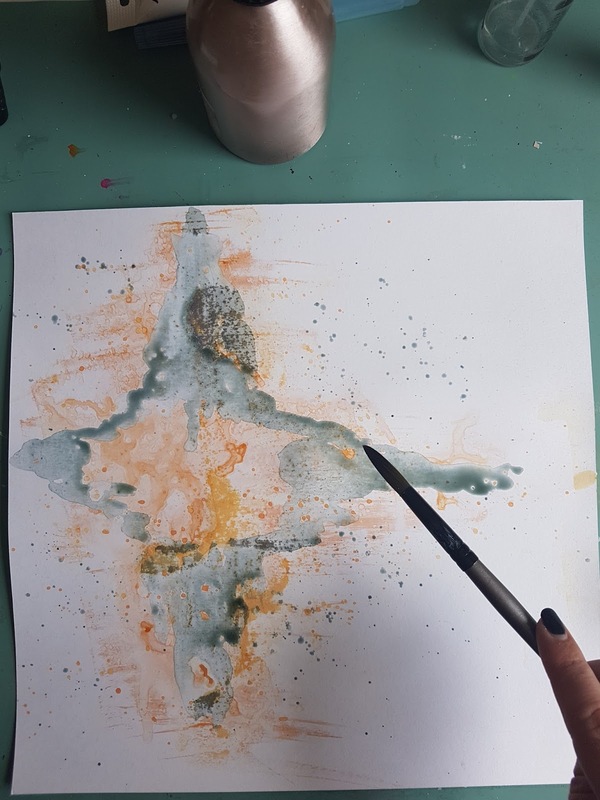 Next to colour the cheesecloth, I inked my craft mat with Foggy Nights and sprayed with water then rubbed the cheesecloth in the ink and used my heat gun to dry and then adhered to the canvas. I cut out a paper doily from the 13arts Fly Away pp Days and Nights and sprayed it using Ayeeda Mist Pastel Cobalt. I also used the Fly Away sticker sheet for the title which I trimmed and mounted onto white cardstock. 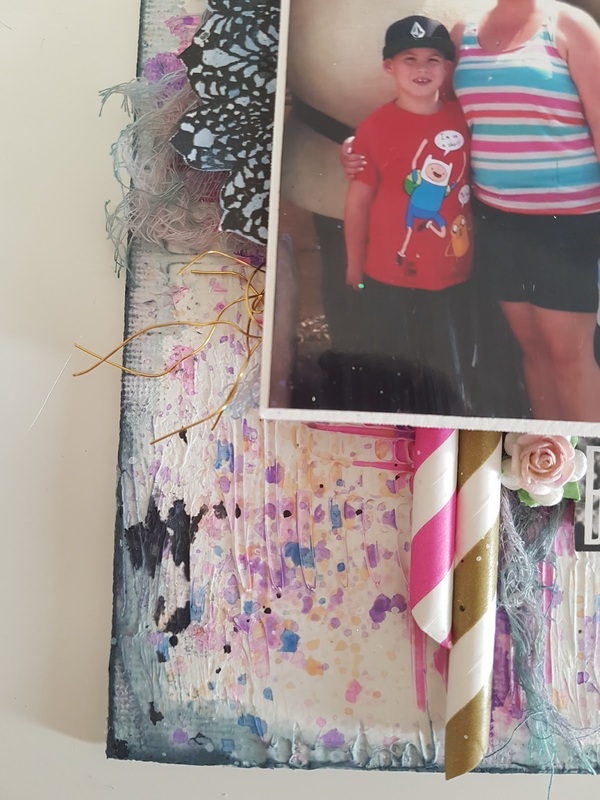 Next I added some gold wire from my stash and some flowers that I had lightly painted with Pastel Pink and Pastel Caramel spray and then splattered using Dylusions Black Marble spray. Thanks for dropping by and look forward to sharing my next project with you very soon. I started off by placing some scrap paper underneath sections of TCW749s Floating City stencil where I didn’t want my paste to go. Because my art journal is 8×8 inches I had to stencil twice. I used washi tape to keep my scraps of paper from moving. I used a palette knife to spread on my Colour Blast Australia Stormy Weather Paste and used a heat gun to dry. Next I used Dina Wakley Scribble Sticks to add colour to my sky and the buildings. For the sky I sprayed some water onto my tray and drew the sticks in the water to create a watercolour consistency and applied with a small paint brush. For the Buildings I drew the scribble sticks directly onto my buildings and used a wet paint brush to blend the colours. I also used Lindy’s Stamp Gang Sprays – Steampunk Sepia and Rusty Lantern Lime. I also applied the sprays with a small paint brush. Once I was happy with the buildings, I then moved onto the water. For this I applied Lindy’s Stamp Gang spray Sassy Sapphire, 13arts Chalk Ultramarine and Chalk Indigo sprays using water and a paintbrush. I wanted to add a little bit of a shimmer to my water so I used a dry paint brush to tap some Colour Blast Shimmer Dust Peacock onto my page and activated it with water. To finish off my canal, I tapped some scrap paper to my Floating City stencil (just to make sure I didn’t get any paint where is shouldn’t go) and used TCW9021 Blueberry Pie Heavy Body Acrylic Paint and a sponge to dab my waves. I did this technique several times until I was happy. Now for my gorgeous Cuban princess!!! I printed her onto normal A4 computer paper and after fussy cutting her, I then adhered her to a thicker card using Grafix Artist-tac adhesive sheets and then added some foam tape before adding her to my page. To finish off my page I stamped a quote using Dina Wakley’s Gal Quotes and black archival ink. I cut the quote out into individual strips and adhered to my page. Hello Lovelies!! 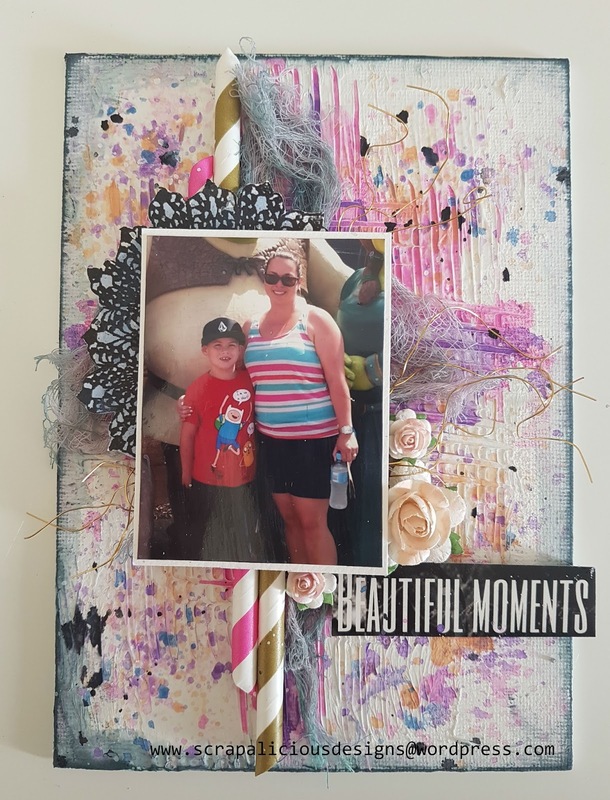 Today it’s my turn to share a mixed media layout over on the Sassy Scrappers Blog. I have linked all the products I have used to the Sassy Scrappers Store throughout the blog for your convenience. 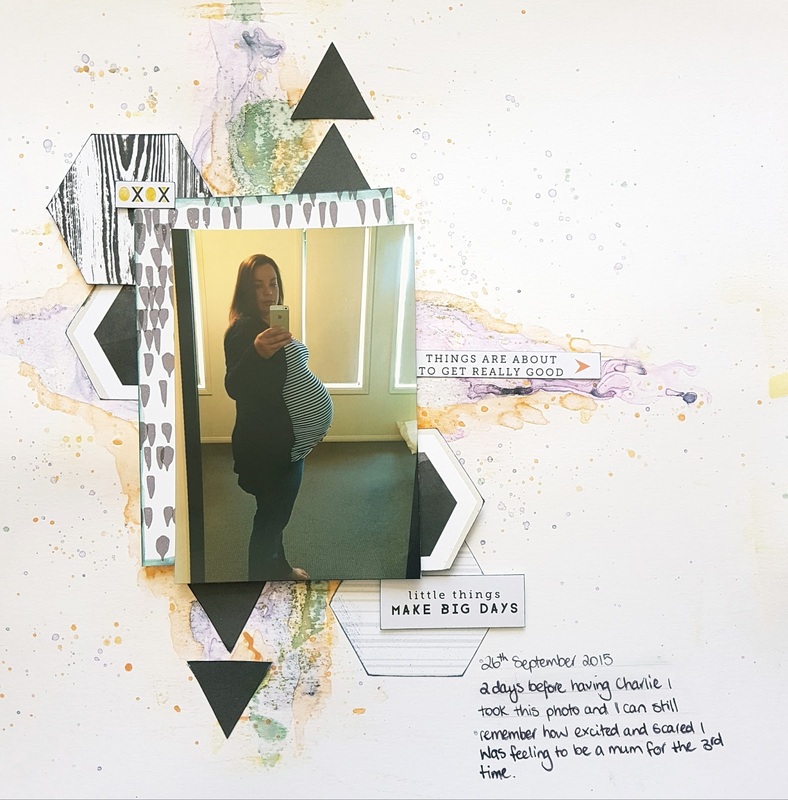 So let me show you how I created this quick and easy scrapbooking layout. I started off by applying a very thin coat of gel medium to my white cardstock and dried using my heat gun. 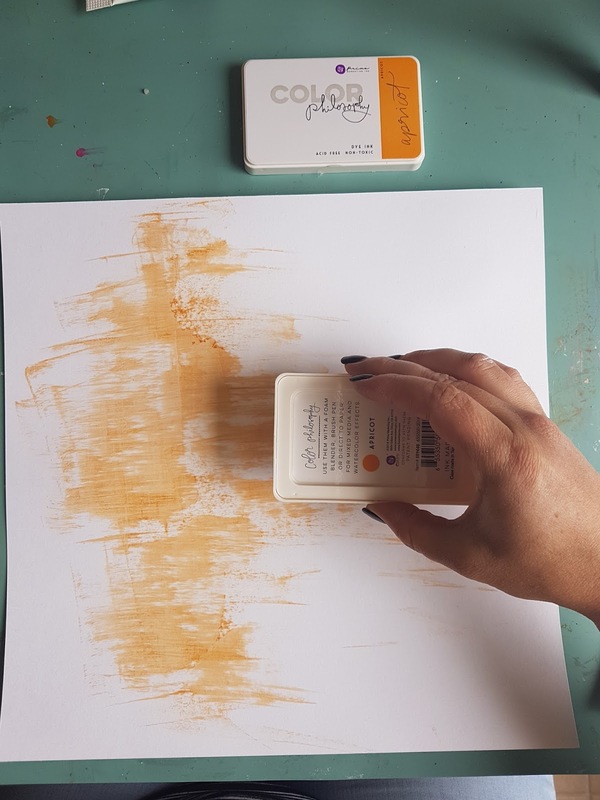 I then applied Prima Color Philosophy Dye Ink – Apricot by swiping the ink pad directly onto my cardstock. I then sprayed a little amount of water to let the ink move around until I was happy. 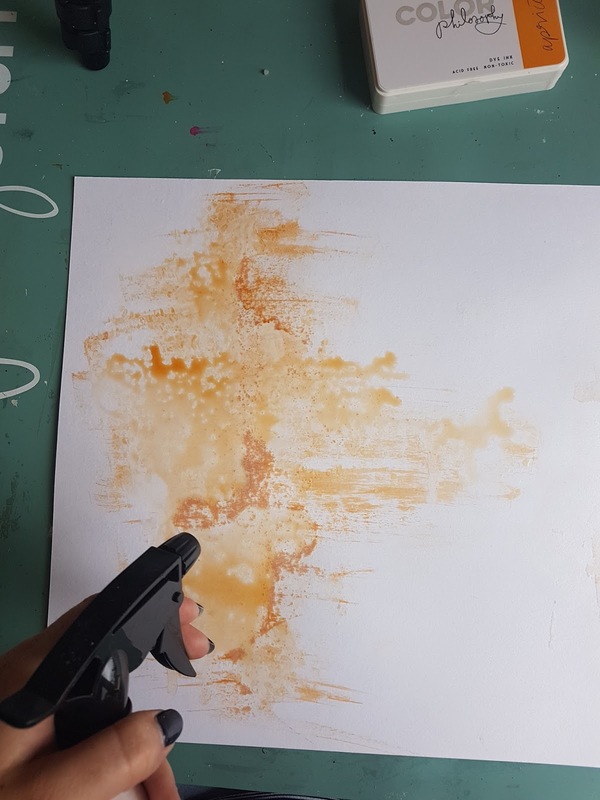 Once it was dry I then splattered 13arts Pastel Caramel Ayeeda Mist and dried again with my heat gun. Next I stamped Prima Color Philosophy Dye Ink – Foggy Nights onto my craft mat and added some water. Using a paint brush I applied the ink to my layout. So that nothing was wasted, I used the left over ink to splatter onto my layout. I then cut a photo mount using Pink Fresh Studios Escape the Ordinary pp – Observe as well as some of the shapes. I used my water pen and the Foggy Nights ink pad to brush the ink around the edges of my shapes and the photo mount. I adhered all the elements onto my layout and then choose 3 stickers from Pink Fresh Studios Escape the Ordinary sticker sheet and inked around the edges again using Foggy Nights. Hello Everyone! Today I am sharing my newest DT project for The Crafters Workshop. 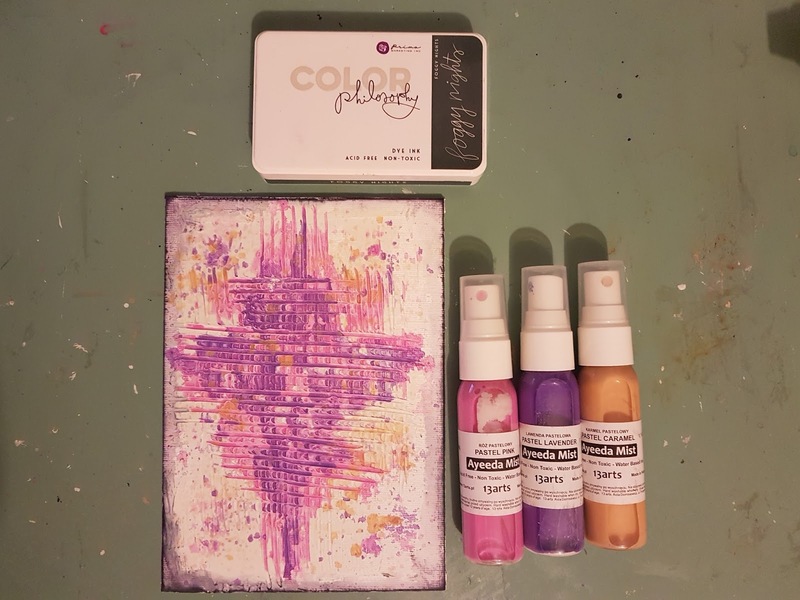 This month we have been lucky to be apart of a product swap with Altered Pages, if you haven’t heard of this awesome company before please check out their website. 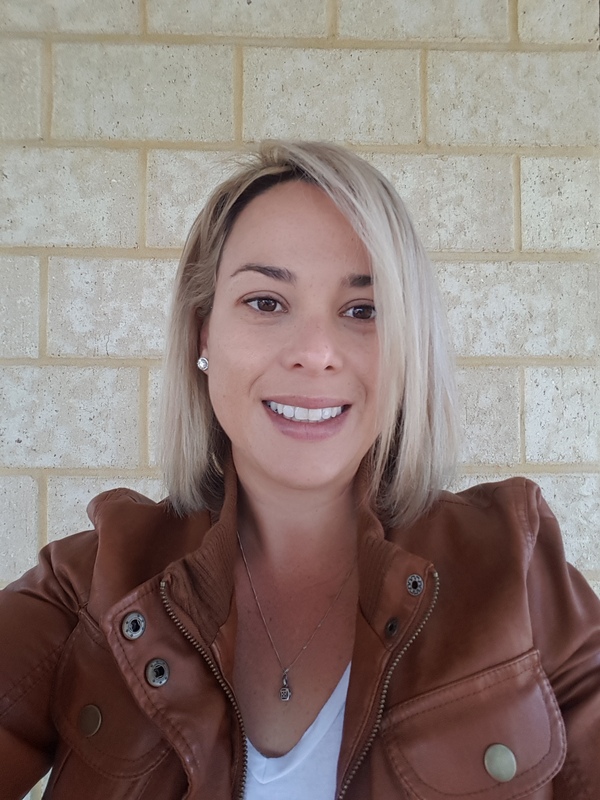 The link is at the end of the blog. Please feel free to check out my process video below. Materials Used – TCW9004 Light and Fluffy Modeling Paste, TCW454s Mini Specimen Stencil, 5×7″ canvas board, Distress Paints – Broken China & Spiced Marmalade, Distress Crayon- Gathered Twigs, Distress Stains – Peacock Feathers, Tea Dye, Hickory Smoke & Walnut Stain, Tim Holts Stickers, Dusty Attic Chipboard – Word Pack #3, Grafix Computer Transparent Plastic Sheets, Grafix Artist-tac sheets, Dylusions White Linen spray, Kaisercraft cogs, metal cogs and Stampendous All Seasonings Embossing Enamel. 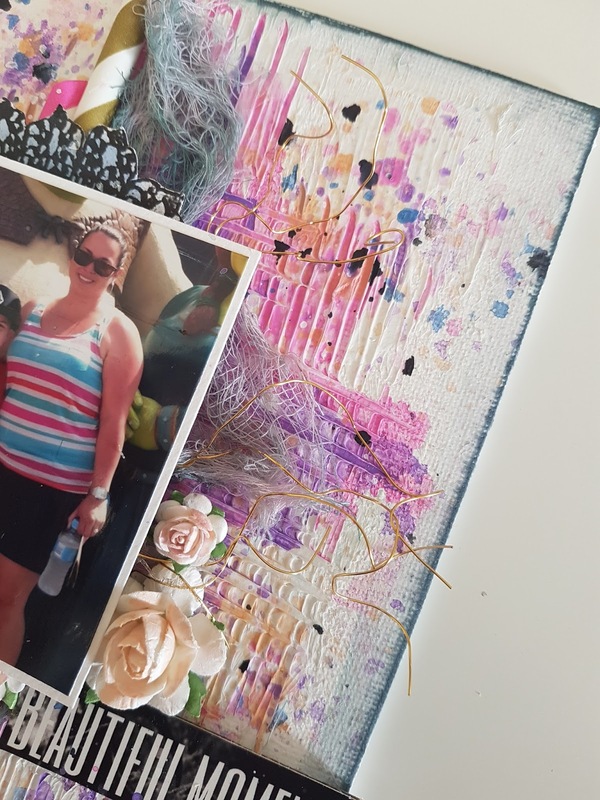 Whoo hoo it’s Friday and today I am sharing a layout using some awesome chipboard by Dusty Attic Chipboard. I had so much fun creating this layout and wanted to try and keep it simple as the papers are quite bold. So with this mind I decided to keep the colours to a minimum – orange, blue black and white. The papers I used are by Fab Scraps #teens collection (I love this range – perfect for boy layouts). I covered the cogs, arrows, hashtag and title chipboard in white gesso first to help the colour pop. The skull I covered with black gesso. For the arrows I used Dylusions Calypso Team and used a paint brush to cover the chipboard. For the cogs and title I used Distress Stain Spiced Marmalade and Fluro Orange acrylic paint. Once they dried I then used a blending tool with Distress Oxide Black Soot to go around the edges. I wanted to add more black to my page so I decided to used the page pebbles chipboard and ink with black archival Ink. 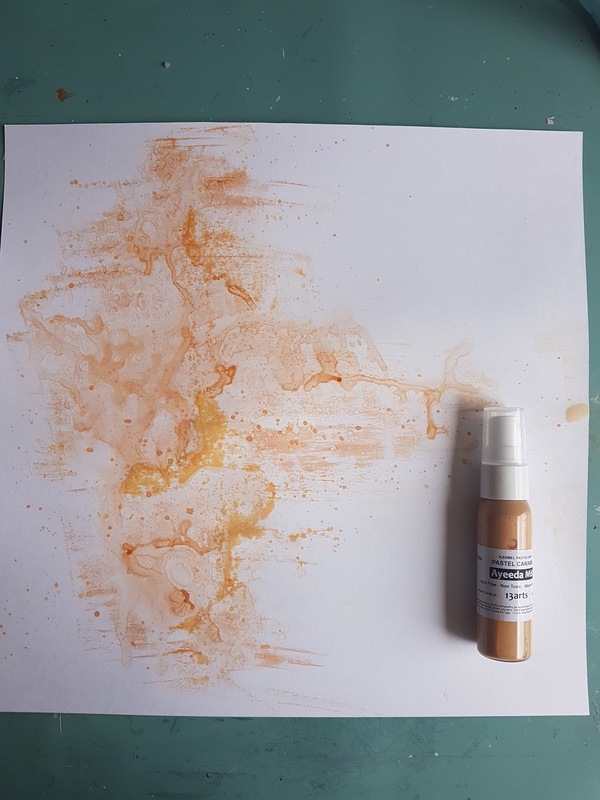 To finish off the layout, I used the fluro orange paint with a little amount of water, white gesso and Dylusions spray to splatter on my background and also on the small skull. I hope you enjoyed my latest creation and thanks for dropping by.